Great interview for this! I love the blend of genre, it does sound really fun and interesting! oh that was fun, new to me author it’s always nice to learn what inspired them to write and how they go about it 😀 great interview! Great interview. With a background like that I bet he could write a really good story and make it believable. Ooooh. This is a new author and series to me. Nice find and great interview. Thank you! Nice interview, I’ve seen a couple of reviews for this book just this week and it sounds fun! Awesome interview! I’m excited to hear that he’s got at least six books plotted. 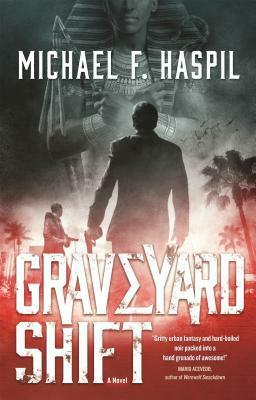 After reading Graveyard Shift, I definitely want more. I really enjoyed the interview. This sounds like a really unique and interesting book. Thanks for sharing! A former mummy? I haven’t heard that one before. Sounds cool. Great interview 🙂 Haven’t heard of this author before but it sounds promising! Bravo pour cette interview et merci de la partager.